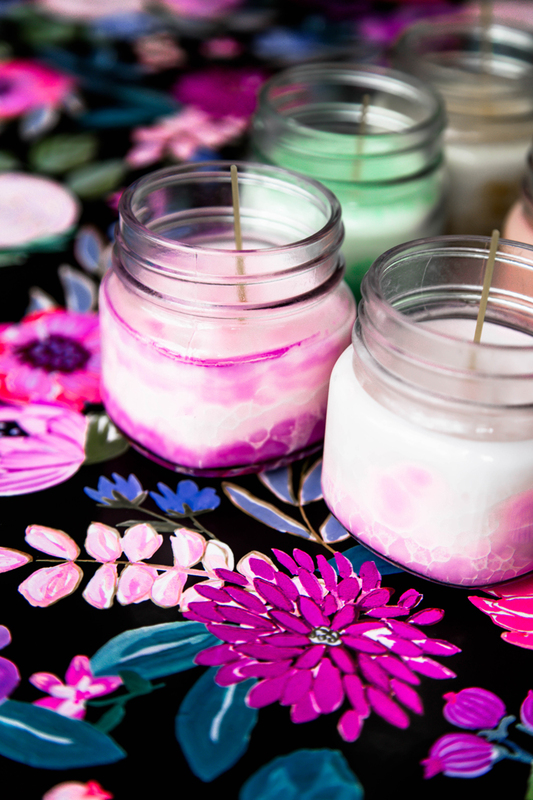 Making essential oil candles is a great way to inject a little needed health into the house, while also crafting up a project that is gorgeous to have around. I’ve always loved homemade candles, like these beeswax candles we created, since they are an easy gift to make for moms, teachers and anyone you adore this time of year. This year, I’m making these DIY essential oil candles with a special twist, a clean burn spaghetti wick! Why spaghetti in such pretty essential oil candles you ask? Because a normal wick can sometimes burns toxins in the air, and we learned from our recent homeopathic doctor visit, that these toxins can actually diminish the benefits of the essential oils in the first place. EEEK! There are clean burn wick options, but they aren’t very affordable – so instead we used spaghetti in ours and it works great! I’ve always been a fan of using fun things for candles, so this is a natural fit to get a little creative with my candle making. 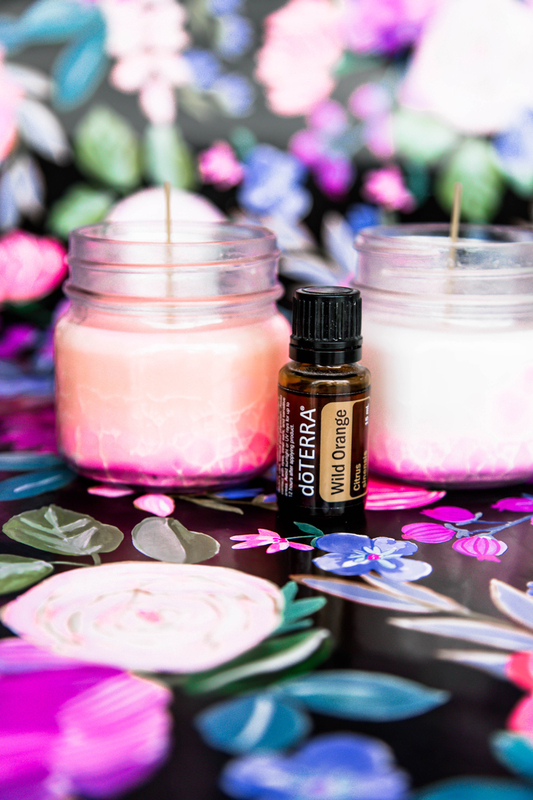 We used doTerra for our essential oil candles, but really any of your favorite essential oil brands will do. 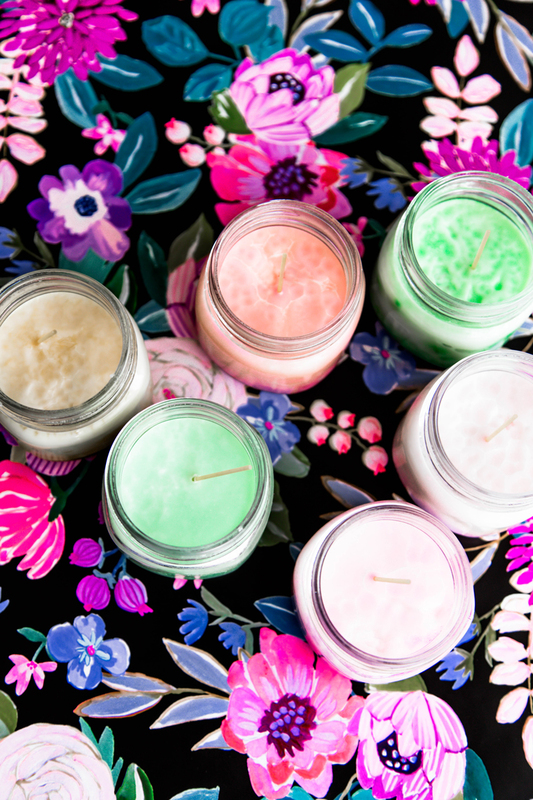 Here’s a quick recap of a few of our favorite oils for these pure burn essential oil candles. Wild Orange – Has an energizing element to it, making it great to burn as everyone is waking up in the morning. Lime – A purifier, this can be a good one to make a candle out of to burn just before guests arrive, it smells fresh and quickly cleanses the air. Lavender – Which is wonderful to burn while getting ready for bed because of it’s calming affect on the mind and body. I have a candle right on my nightstand that we use daily. Peppermint – Helps with clear breathing and can be a good candle to burn whenever you may be feeling a bit under the weather. I also like to burn this one in the bathroom when I’m getting out of the shower. 1. Scoop coconut oil into glass measurer and microwave at 30 second intervals to melt the oil to a liquid. 2. Pour the coconut oil into a clean and washed mason jar. 3. Unwrap the crayon color of choice and break into small pieces. Drop the crayon into the mason jar with coconut oil. 4. Stir to melt the crayon wax and distribute the color. Heat for 30 more seconds to melt the crayon the rest of the way. 5. 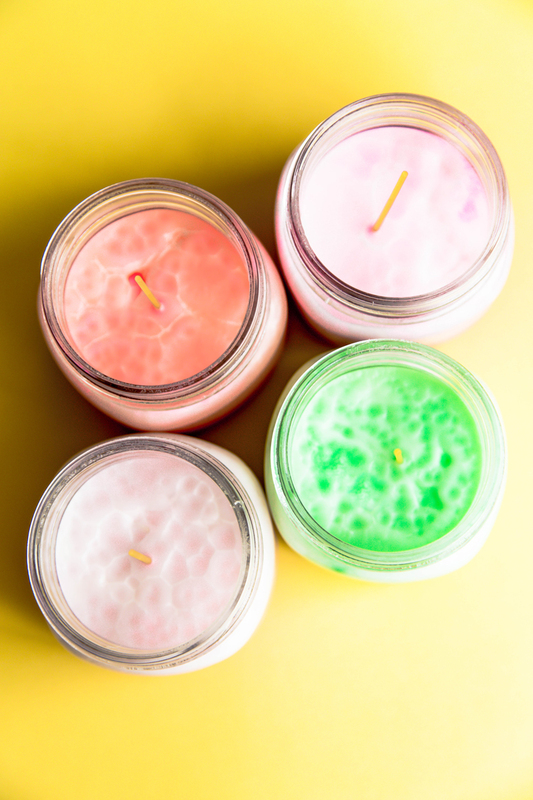 For these small mason jar candles we add 5-10 drops of essential oil to the candle. Using the dropper, just drop the amount needed into the colored oil and stir well. 6. Place 4 strips of tape over the jar top, making a hole at the center. Slide a piece of spaghetti noodle through the hole. 7. Slide candle into the fridge to cool. 8. Once solid again remove the tape, light the noodle and enjoy your candle! 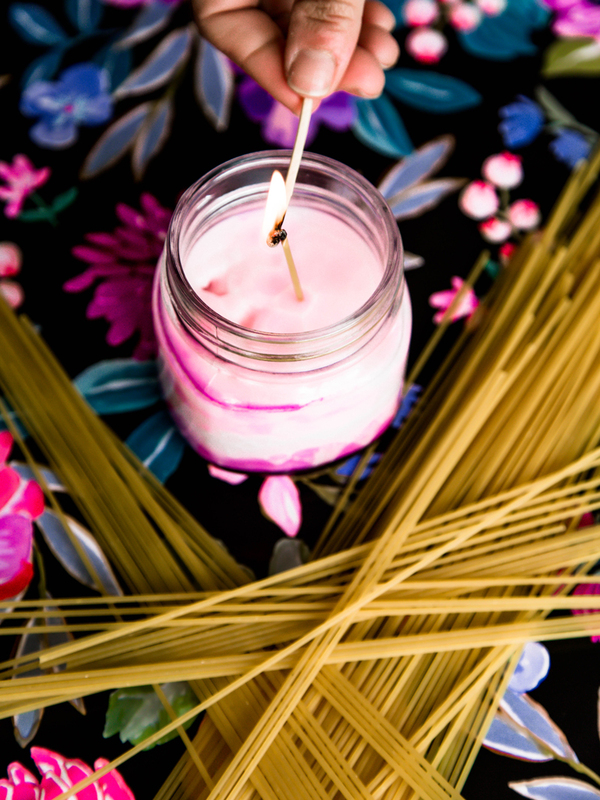 I love using these spaghetti noodles to create a clean burn on our essential oil candles, you can make them with a regular wick as well – but to get the best benefits from burning, look for the cleanest option you can afford. 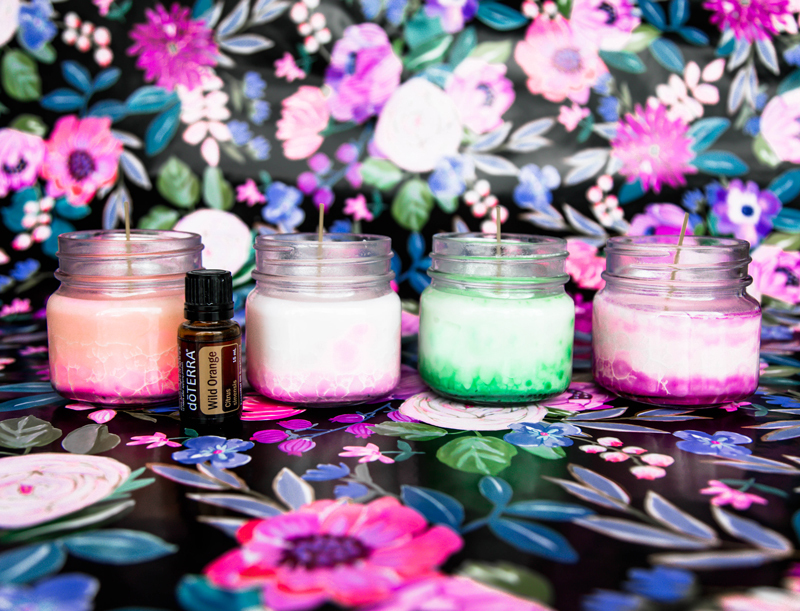 One other note* Although these essential oil candles are awesome for burning on a night stand, mantel or in the bathroom, I’d steer clear from burning them in the kitchen. I’ve been learning a lot lately about how the oils interact with other elements in your home and they don’t always play nice. Inhaling the essential oils can sometimes not allow for you to taste food the same way and if you ever use probiotics, the oils in the air can be detrimental to their effectiveness on the body. But, in the bathroom there’s nothing better than clean burning essential oil candles! Enjoy making and gifting these beauties this season. “clean burning” wicks are kind of a joke the. Most wicks you buy are just cotton or plant fiber- no one uses lead in wicks anymore. Spaghetti noodles can’t be cleaner burning than cotton, since spaghetti noodles have lots of ingredients while cotton has one- almost pure cellulose. I do think spaghetti is a good idea for wicks, since it’s rigid and burns, but cleaner burning, it is not. Wood wicks might be labelled as cleaner, and they might be, slightly, but spaghetti isn’t wood. There’s a lot of science to candlemaking, but most of it isn’t necessary to just have fun with wax. Seriously though, make one of these with a real wick, or cotton or hemp “twine” or cordage. You’re sure to get a better burn.